I noticed these errors this morning. Any ideas? Two such drives had similar messages, but on msp2:0 (i.e. the other drive was (da19:mps2:0:12:0)). recommended polling time: ( 542) minutes. I'd say the disk is close to dying. I'd keep a close eye on it, it's likely these errors will get worse and may start stalling the whole pool (due to the bus resets). I don't see anything alarming in the SMART stats other than the 5 g-force alerts (which didn't cause any sector re-allocations). It passed a short SMART offline test within the last few hours. There were some recent commits (within the last month or so) with fixes to mps(4). They probably don't have any impact (for better or worse) on this issue. I had not noticed that, thank you. I am in the process of replacing the existing 3TB drives with 5TB drives. Power may be an issue. I found the drive specs, but it does not differentiate between 5V and 12V draw. I may be OK with a 24A 5V and 80A 12V given total draw is 20x 11.3W = 226W. I imagine at startup would be the most power draw. Can you stagger the startup of the drives? That tells me the motor uses 12V and the circuitboards use 5V. NOTE: the SATA drives are all on a backplane in a IPC-ML4U20-MSAS 4U chassis and I've just written the manufacturer for more information about staggered spin up. There are a number of different methods. SSU is one. PUIS (Power Up In Standby) is another, but I don't believe LSI controllers support it - it was more of a 3Ware thing. What sort of cabling are you using? Are all cables properly seated, routed appropriately, etc? If you have lots of individual drive cables running next to each other for long distances, are you using spread spectrum clocking? Are there any SAS expanders involved, or does each drive have its own dedicated controller port (you have at least 3 mps(4) controllers, so I hope you don't have any expanders)? You reported several drives showing this error - what is in common between them - same backplane, same power supply connector, same data connector on the LSI controller? Do you have another power supply you can test with? 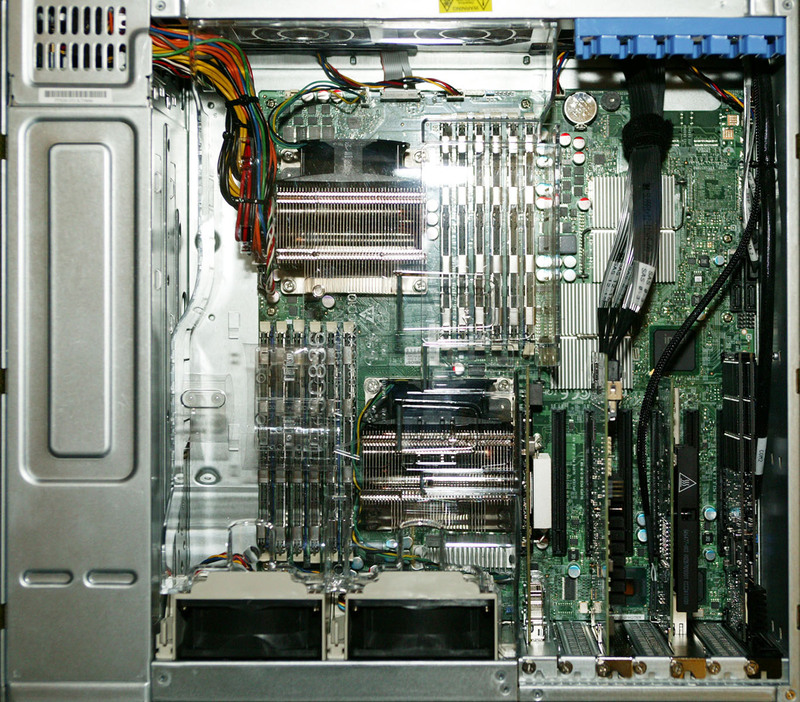 This last may be difficult if this is a not a server chassis with hot-swap connectors, particularly if you have a rats nest of mixed power / drive / etc. cables. That's why I use server chassis and then make every single cable to the exact length needed, like this. This did not happen upon power up, no. I'm using SFP 8087 cables between the SAS2008 cards and the backplane. There are 20 drives, which means 5 cables. I have no idea about spread spectrum clocking. There are no SAS expanders. Everything is SATA. All drives are in hot-swap drive trays. There is only one power supply in this chassis. It is unlikely that you are having a noise / interference problem with SFF-8087 cables and a good backplane. This wouldn't happen to be a Norco brand case, would it? This. But likely not relevant with the drives / cabling you have. If you can do this without risk to your storage (for example, if you are using drive labels or GUIDs in a ZFS pool instead of hardware device names), you could try swapping these two drives with 2 other drives that are on a different controller / data cable / power supply cable and see if the problem moves with the drives or stays with the physical slots. No, it is a ML4U20. If the problem occurs again, I'll swap the drives around. SSU is not implemented on that backplane. Eight days later. This is the second of the drives mentioned in the original post. Background but not necessarily relevant: since my previous post, the system now contains 20x 5TB HDD at 11.3 W max each, and was power cycled on Thursday (2 days ago). The following events occurred about 1 day 14 hours after power up. At the time, a zfs scrub was underway for the zpool in question. My review of the below indicates it is very similar to the original (shown in the [gist in the original post](https://forums.freebsd.org/threads/62183/) of this thread). Darn little information. We know that the drive spun up twice since yesterday, and that both times it was power cycled. That could very well be the cause of the "unit attention" that's reported by the low-level SCSI code and shows up in dmesg. Most likely, the power supply situation is still not good enough. Might be a waste of time, but here is an idea: Perhaps the real problem is not the power supply, but the AC supply into it? Maybe you have rare short power outages, or power drops, not long enough to completely kill everything and cause a shutdown (or make the lights go out), but long enough for the biggest power users (20 disks) to notice? Perhaps it's something like the AC circuit is being shared with a really big consumer (air conditioning in the summer, or a big water pump or fan) whose startup surge takes the power down too far? One way to diagnose this would be to put in a UPS; those tend to be pretty good at monitoring power. What disturbs me is the g-sense error rate. Seven times in those 24 hours, the drive detected that it was vibrating or shaking too much. That's bad; vibration is the #1 cause of one of the most dangerous disk errors (off-track writes, which are dangerous because the error is not detected while reading, and the drive returns obsolete content). If the drive is vibrating enough to detect errors, that's bad. You should look into what's causing the whole chassis or that drive to vibrate. In the old days, when we still had full-size CD-ROM drives, the #1 cause of disk vibration was being mounted right next to the CD-ROM; today it's usually sympathetic vibration from the neighboring drive. Power_Cycle_Count is it not, from 54 to 56? NOTE also, it was not 24 hours between smartctl readings. It was between Aug 25 and Sep 2. There is a UPS in use, an APC 2200. Re vibrations: I suspect the major vibrations might be: opening/closing the rack doors. inserting other drive trays. Yes, the start/stop count delta is exactly the same as the power cycle count. That tells us that each time it spins up, it is caused by what the drive perceives as a power cycle event (whether it's real or not is the big question). Big oops on my part: I didn't pay attention that this was over a multi-day period, not just 24 hours. So we're saying: There is already a UPS in use (and it is a big one, the 2200 is not one of those office-supply cheap ones), there were no real power cycles, yet this disk saw two power cycles? That would mean there is still a minor power supply problem. But two power events in over a week may not be a big deal. The other big question is whether the increase in the vibration (the g sense error rate) is significant or not, and whether it is commensurate with your explanation of human operations (doors, drive trays). The problem with SMART is that the values are only calibrated on a vendor- or device-specific level. So we don't know whether the increase from 262 to 269 is a big deal or a statistical fluctuation. If it bugs you, you'll have to contact the vendor support to find out. There were indeed two power cycles. I powered it off at least once to remove an internal HDD. When powering up, there was a boot drive issue, so I had to reboot. It might interpret that as a power cycle. FYI, the system booted just fine with 20x 5TB drives. (I thought I posted this several days ago). Don't mind me. I'm just keeping track here.